Gender norms don't seem to have a huge focus in Beach City, or even in the world of Steven Universe. Steven wears a dress, Pearl wears a suit. 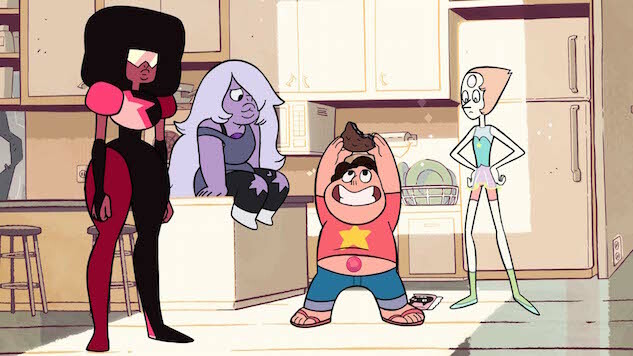 Sugar spills some very cool info about SU and it's origins in this article by Paste Magazine. Catch a preview below, and the full story at the link! One of the things I really wanted to do as I went into this show was address how intensely gendered shows for children are and dissolve that. That was my first goal. And I think it came in large part because as a little kid, I always gravitated toward boys’ shows and I felt extremely guilty about that. And I don’t feel like my child self should’ve had to feel bad, but I understood that this is not really for me. And so when we went into this, I wanted no one to have to feel that feeling. I wanted everyone to feel like if they wanted to feel it, then this was for them. Especially in terms of it being gender-nonconforming as a show. Story: Is It Really Okay?